After the tremendous effort of Indianapolis as the host city for the Super Bowl, I’ve never been more proud to be a Hoosier. Moreover, as a communications student looking to start my career in Indy after graduation this May, I’m thrilled at how social the entire community has been in the weeks leading up the big game. From the #social46 influencers chosen via Klout to ramp up extra attention surrounding the events, to the Super Bowl social media command center established by Raidious, I was very impressed by the planning and strategy that set the stage for one of the largest social events of the year. It was also great to see ExactTarget, a company built on interactive marketing, play a large role in the events. Their home base is mere steps from Indy’s Monument Circle and they had a tremendous view of the activities from their office. ExactTarget spent the week leading up to the game through 11 p.m. on game day tracking social media mentions and likes for participating teams and advertiser brands. 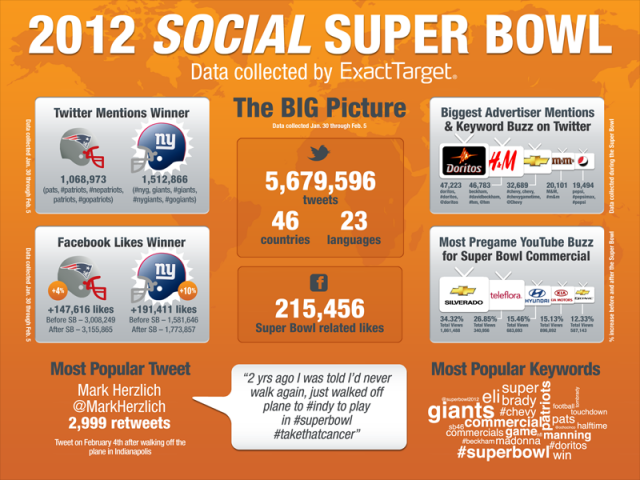 Here, in a visual nutshell, are some highlights about social media use during Super Bowl 46. This infographic originally appeared in a post by Kyle Lacy for ExactTarget. What were your takeaways from all the hullabaloo surrounding the 2012 Super Bowl in Indianapolis? What did you learn about building community, advertising or social sharing?